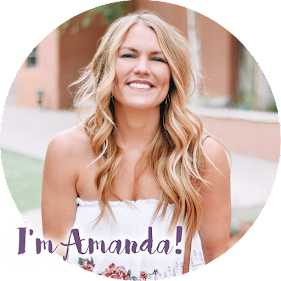 Thanks to your suggestions, I've decided to start a monthly series on Amanda's OK called Best of OKC! 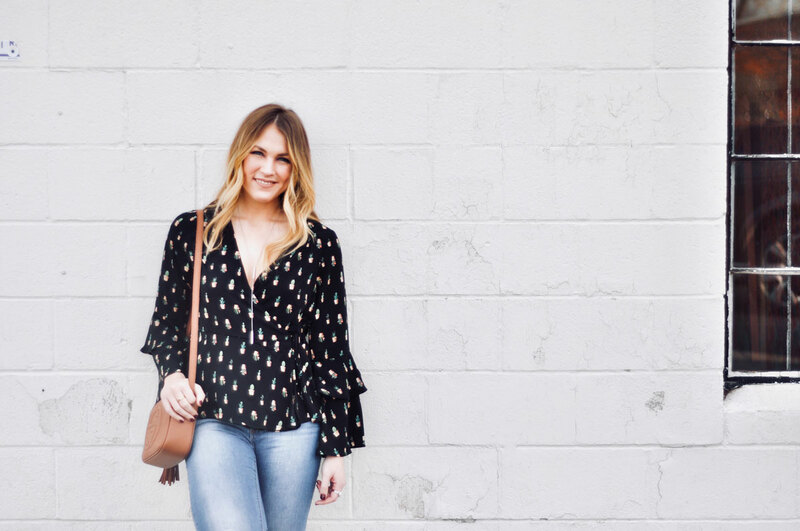 Each month I'll pick a topic and share my favorite local spots in that category. 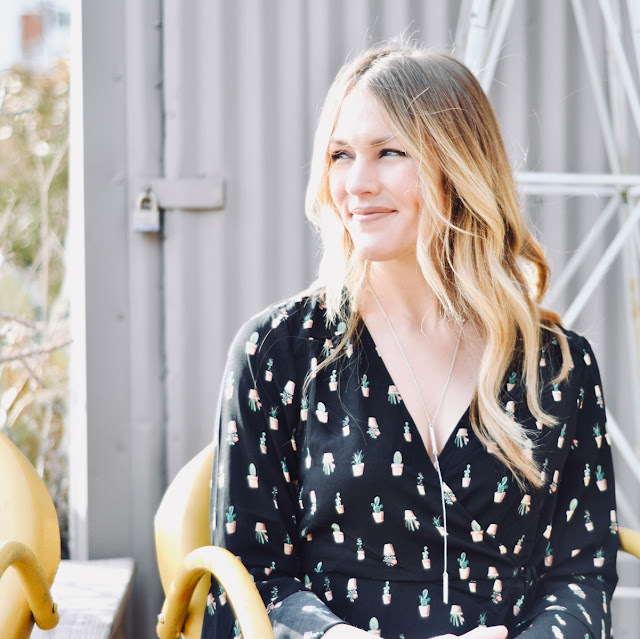 I'm thinking things like best brunch, best boutique, best date night restaurant, best cocktails, best pizza, tacos, dessert, etc. If there are any specific category requests, please send them my way! 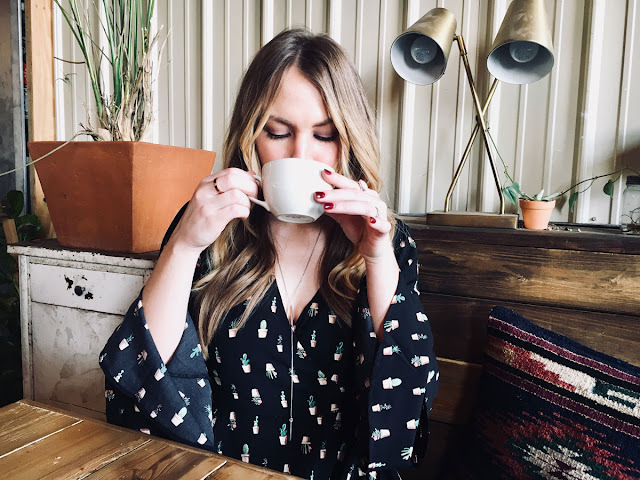 I'm kicking the series off with the best coffee in Oklahoma City because, well, coffee. I'm kind of a coffee snob.....my co-workers make fun of me for bringing my own coffee to work each morning. 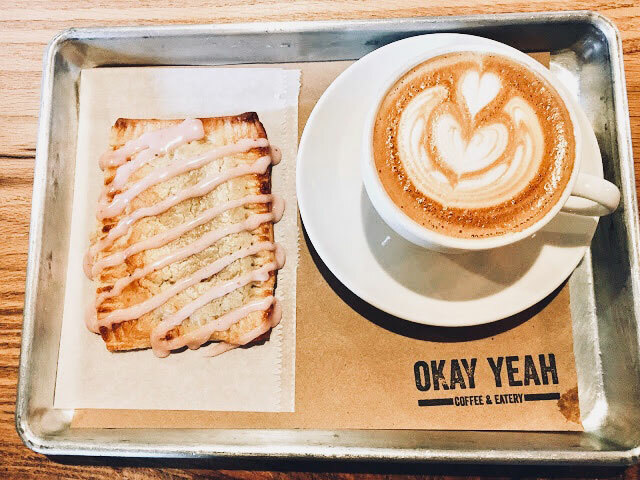 Every time I visit a new city, I make it a priority to find the best local coffee shops and the best donuts! What can I say? I appreciate good quality coffee. Yes I frequent Starbucks, but I always prefer to drink local coffee, if at all possible. 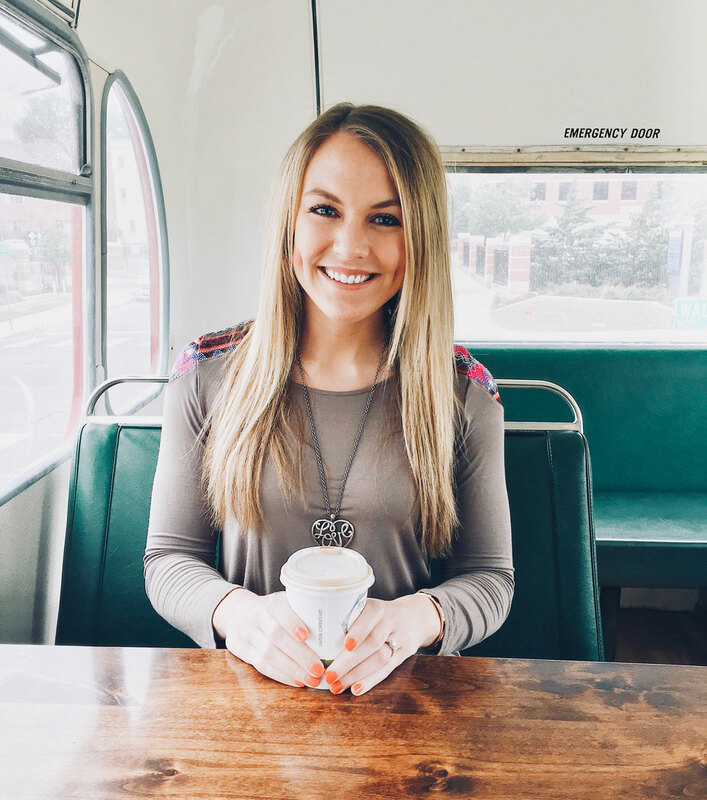 Below are my favorite spots to grab a cup of joe in OKC. 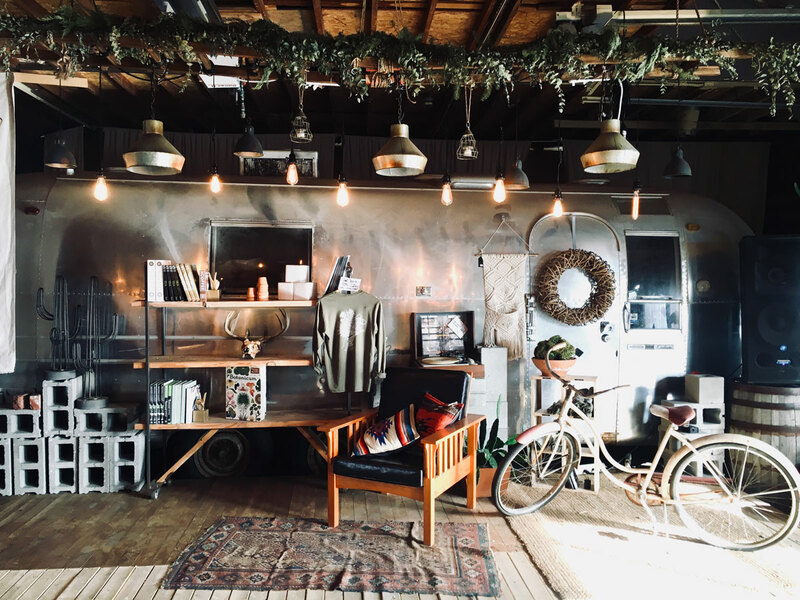 This is the kind of coffee shop that makes me wish I worked from home so that I could actually work from Okay Yeah. They share their space with The Plant Shoppe meaning cacti and succulents are 'errwhere (basically Instagram heaven). 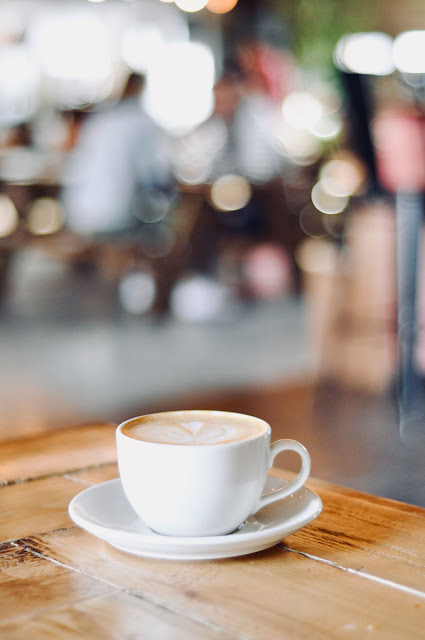 Their menu changes frequently but you are always guaranteed something delicious like rosemary or lavender lattes - yes please! I especially love their food menu because of the hand tarts (i.e. a homemade Poptart). The only negative thing I have to say about Okay Yeah is that they are closed on Sundays, bummer! So many local restaurants serve Elemental coffee which means it has to be good, right?! 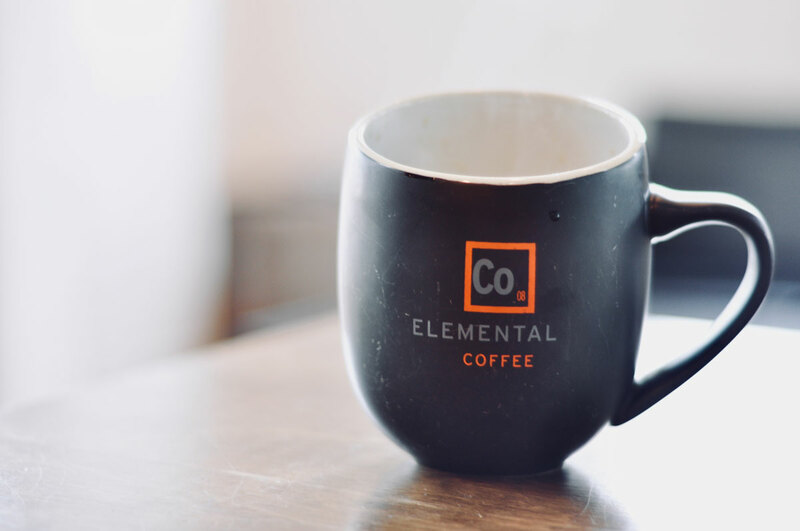 They sell their high quality coffee in bulk and they also offer delicious lattes, hot chocolate, cold brew, etc. 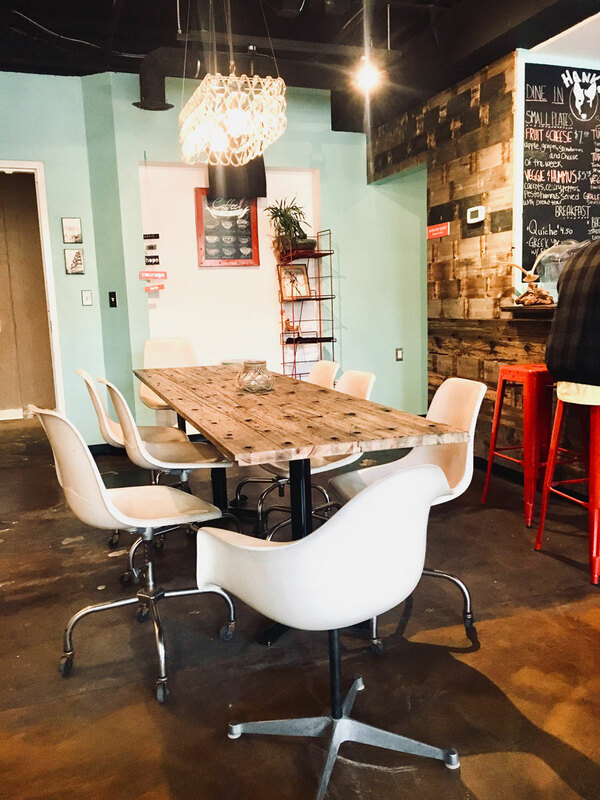 My favorite part is their baked goods and refrigerated foods - so many yummy things like vegan donuts, fresh baked breads, over night oats, cookies and more. They serve brunch on the weekends and breakfast + lunch on weekdays. A solid choice for a place to study or meet a friend for a drink. C and I ride our bikes here sometimes on weekends and enjoy coffee on their patio. The new kid on the OKC coffee block! 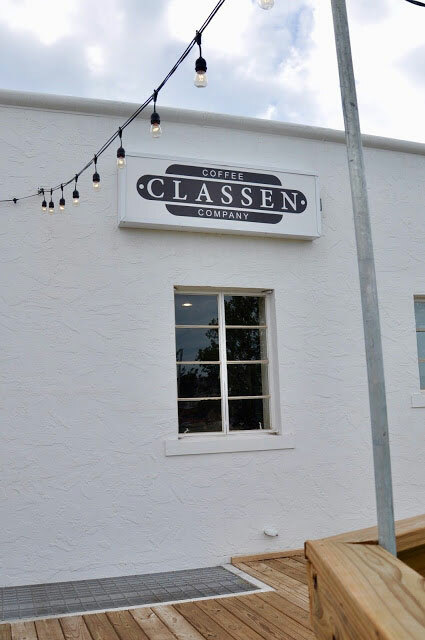 Classen Coffee is literally two minutes away from our house so we frequent it regularly. It is located in a historical building that sat empty for years before they brought it back to life. I especially love that they have a drive-thru (Kylo appreciates it too, everyone loves when he is in the back seat), and the patio under the bistro lights isn't too shabby, either. I can't recommend their chai latte enough and their sugar free blended coffees make for an easy low-cal treat. 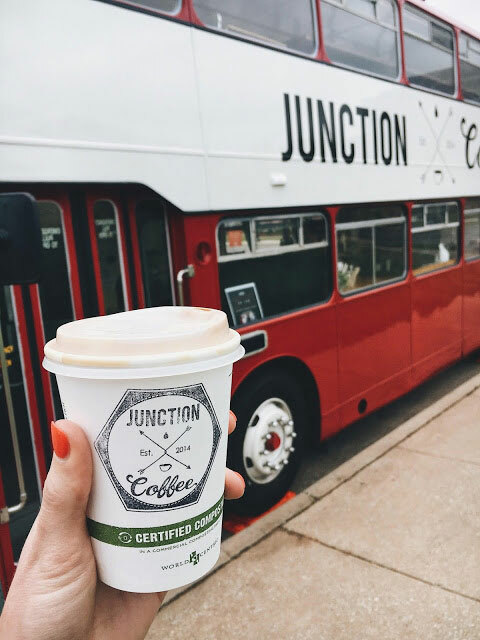 I had to include Junction Coffee in this list because ITS IN A RED DOUBLE DECKER BUS! It takes me back to London and I love it. Seriously, though, the ambiance is incredible but their coffee is delicious, too. I appreciate their milk and syrup options and the ability to customize or "healthily" your drink order. Since it is technically a food truck, you have to track them down via social media before heading their way, but they are pretty easy to spot! I love sitting in the top half of the bus and watching the city go by. I love going to Hank's because they allow dogs inside! Also, can we talk about the wine part of their name? Yep, they make the "coffee until wine" saying a reality. Their coffee isn't my #1 favorite, but they always have tasty snacks like mixed nuts, cheese and fruit trays. 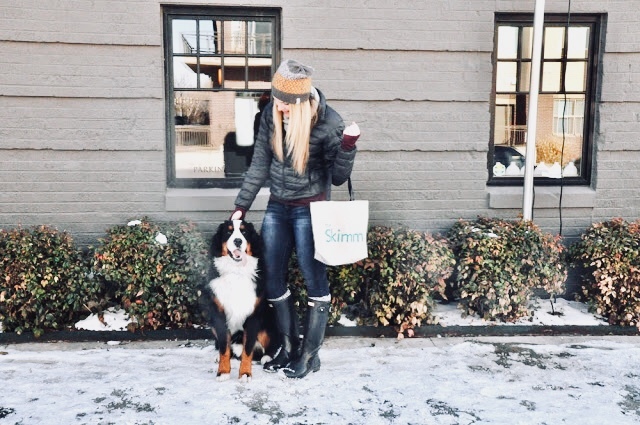 I'm also a big fan of the subway tile, chandeliers, exposed wood and teal accents - basically my design style to a T. We like to come here on rainy weekend afternoons to get the dogs out of the house for a bit. 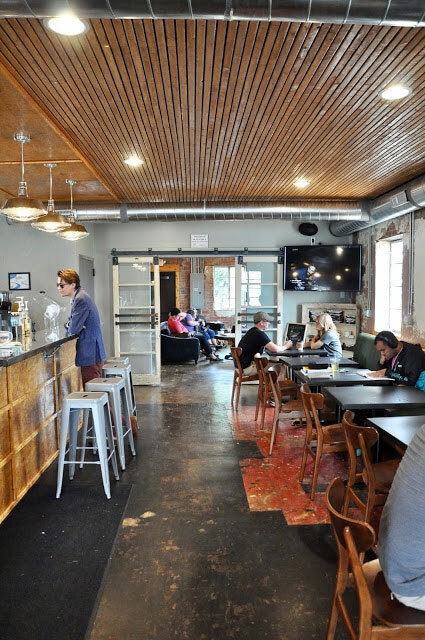 I want to give a special shoutout to Aurora Breakfast Bar and Cafe Kacao - though neither are necessarily "coffee shops," they serve some of my favorite specialty coffee drinks in town (and delicious food, too). There you have it! 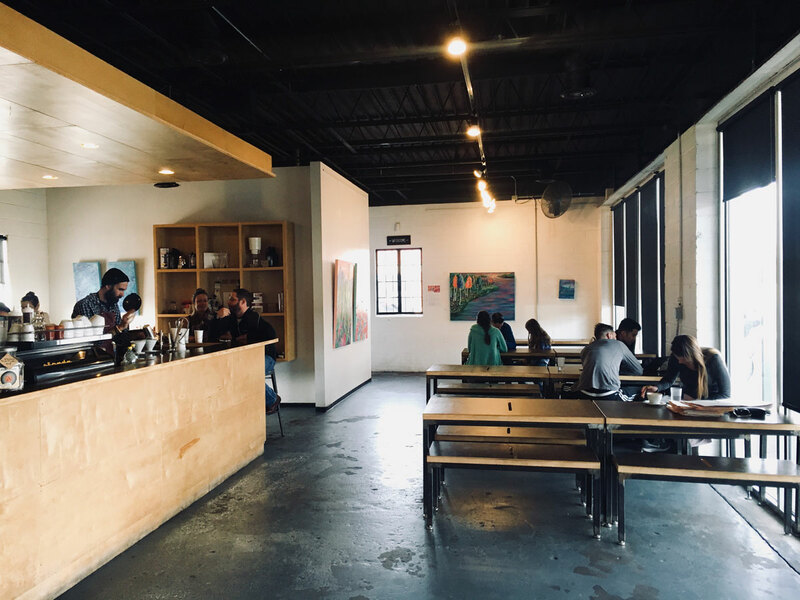 Have you been to any of these coffee shops? Are there any I missed that you think should make the list? Let me know in the comments - I'd love to try out your favorites soon.